Apple has today seeded the latest version of Lion, version 10.7.2 build 11C17 to developers, which has iCloud goodness all packed in, reports Macrumors. This version adds some updates to Lion Recovery and Find My Mac, but otherwise seems to be a maintenance update. Developers can visit the Apple Developer Center to download this latest version of Lion. Earlier today, Apple updated iTunes to 10.5 beta 9, which is being used to test iTunes Match, the cloud component of iTunes that will allow users to upload and match their songs in the cloud. There have also been some reports of emails being sent out to iCloud members earlier than intended as well. The emails, as reported by AppleInsider, are intended to welcome new users to the iCloud service. 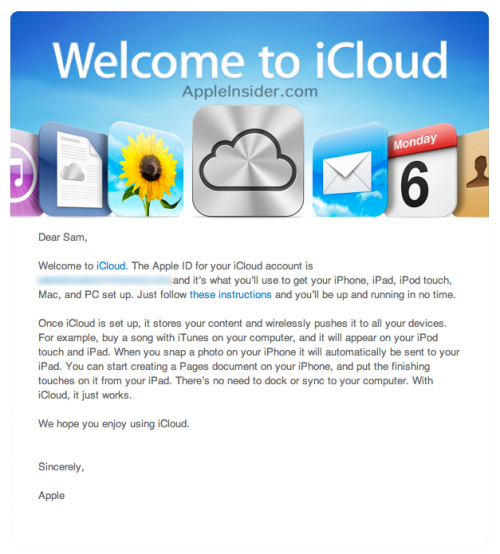 The letter gives a quick description of how iCloud works and the fact that there is no reason to sync your devices with your computer once you are using iCloud.